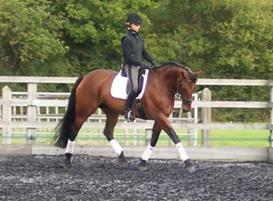 We currently have clients looking for dressage horses from Novice to advanced, 15.3hh to 17.1hh. See horses wanted tab above. 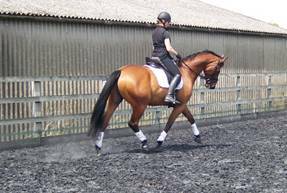 We only take one or two horses in for sale at any one time, all are assessed for their suitability before being offered for sale. The price is agreed with the owner after assessment to ensure a fair value is placed on the horse and a sale can be achieved within a reasonable time frame. He has competed Elementary/medium, 169 BD pts, previously placed at National Champs at novice. 3 very nice paces, with a very good walk. Was competed by Paula last year at elementary gaining scores up to 72%. Very easy to handle, shoe, travel and good to turnout, in all a lovely character. 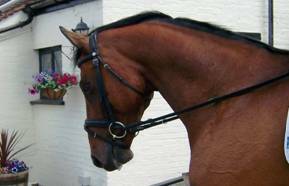 Ideal for any competent amateur who wants a horse to train on and enjoy. New owners very happy, so pleased to have found the right home! Superb competition horse with 130pts having won at Novice and Elementary. Now ready to compete at medium level. With good lateral work and a willingness to learn. 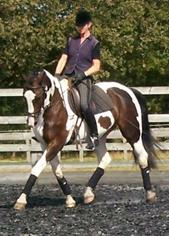 Working elementary/medium with 3 smart paces and a friendly temperament. 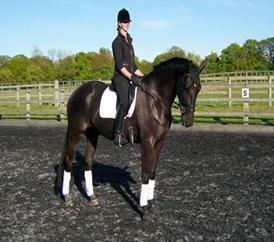 This lovely compact horse has three excellent paces with an active trot and expressive canter. Has won at PSG/Inter I level with established tempi changes and good lateral work. Has an excellent competition record, won & placed at regional and National level. This year has won PSG Q and was well placed at the Hickstead masters Adv Medium final and Regional finals at Oldencraig. 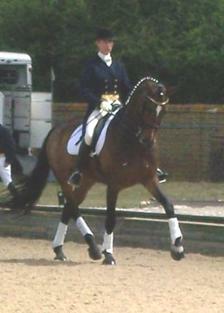 Qualified Nationals 2008.
ery p of this she is also easy to handle, travel, turnout etc. ion and the canter is big and uphill just what you need. 7 Year old bay mare reg. Anglo European Studbook. TB x Dutch. She has 3 excellent paces, with an active hind leg and good length of neck. She is nicely forward going and good in the contact. Has started lateral work and can do a change. 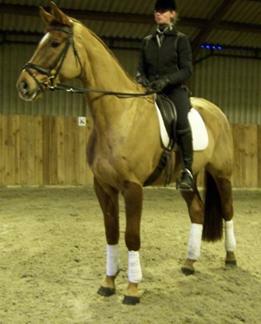 5 year old Bright Bay 16hh gelding by Royal Dance. This athletic little horse has three excellent paces with natural cadence in his trot. Working very well in the school, has started lateral work and counter canter and shown ability to do a nice clean change both ways. Won the Strada Young Horse Championship last year. 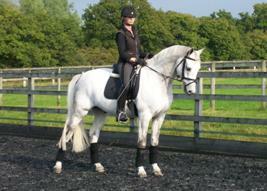 Ideally suited to junior or lady rider looking for a smart horse that is easy to ride and handle. He has no vices and is a real sweetie in the stable. 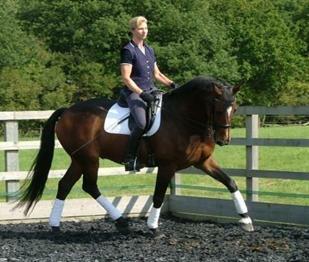 4 year old 16.2hh Oldenburg mare by Farewell III. 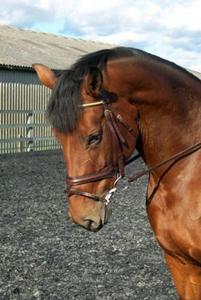 Superb mare with three big paces and a lovely temperament. Bred by Lois Allard of Coady Bay Stud. Qualified her for the 4 year old Shearwater Championship at Stoneleigh. Just started schooling for dressage having previously Showjumped. 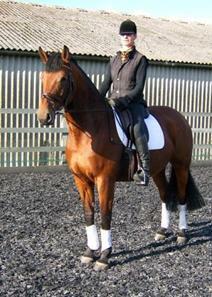 He has a huge springy trot (gives you a lovely feeling), balanced canter and a good walk. Light in the mouth and very willing to learn. 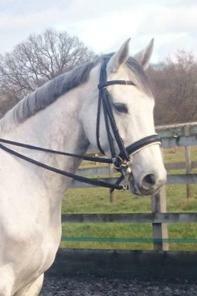 Has a lovely temperament with a very kind face, good to hack, shoe, clip etc. 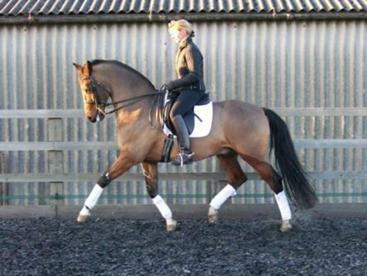 This lovely quite compact horse has 3 good paces with a smart trot. 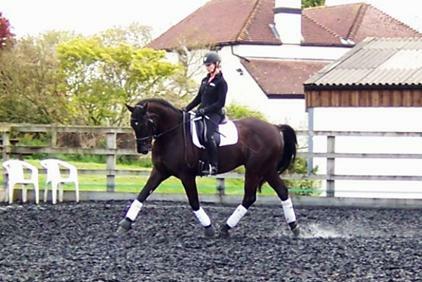 She is working towards medium level with very good trot lateral work. and would be a very good one to learn and progress on. Has been lightly competed and is very easy to handle. Owner/breeder has sadly decided to sell due to lack of time.